The Dairy farm’s water recycling system is a game changer for agriculture. Coldstream Farms of Deming, WA, a family farm in the Northwest corner of the state, is working to turn their 2,500-cow dairy into a zero-waste business with a cutting-edge filtration system that will transform the cow manure into clean water. On average, the cows at Coldstream Farms produce about 60,000 gallons of cow manure a day– 22,000 of which will go through the system’s combination of nanofiltration and reverse osmosis and transform that cow manure into 12,000 gallons of clean water daily. After treatment, the water will be clean enough for the cows to drink, irrigation for the farm’s crops, and even benefit local salmon runs by increasing streamflow. Other products of the system will be approximately 16 yards per day of nutrient rich solid manure and 8,000 gallons of nitrogen and potassium-rich concentrate which is suitable for use as chemical-free fertilizer. These concentrated nutrients will be used by the farm as well as other local commodities, like berries and potatoes, to replace imported fossil-based fertilizers. Nutrient management techniques vary significantly across Washington, especially between eastern and western farms. 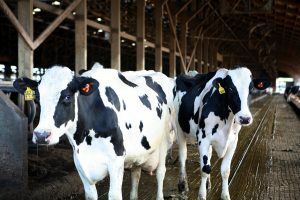 The wetter western climate has its benefits, but when it comes to managing cow manure, it can present a unique set of challenges. One of those uses is through a partnership with the Public Utility District (PUD) #1 of Whatcom County and Department of Ecology to create a convergence between the dairy’s clean water and the nearby Nooksack River. Coldstream Farms was awarded a $930,305 grant from the Washington State Conservation Commission (WSCC) to help cover installation, operating costs, and research. Why did the farm decide to invest in this technology? For additional information, contact Regenis at 866-578-8630 or Stephan Jilk, PUD General Manager at info(at)pudwhatcom.org.